he ATS 3X6 Pistol/Rifle Pouch was designed for crew chiefs, who don’t have much space to carry ammunition and needed as compact a footprint as they could get. It holds six M16/M4 magazines and three double stack pistol magazines. The rifle magazines are secured with bungee straps that facilitate the wearer with quick access to additional ammunition. Pistol magazines are firmly secured with an adjustable and removable Velcro-closed strap to the front of the pouch. ATS L-Straps allow the pouch to be mounted to any MOLLE compatible modular carrier. It measures about 10 inches wide by about 8 inches tall, and about 4 inches deep. 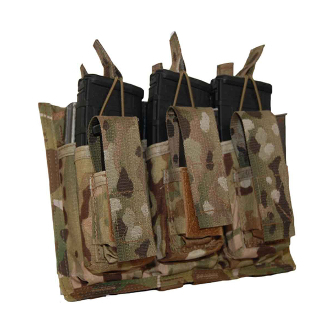 The pouch uses 6 channels and 8 rows of MOLLE space. It weighs just 9 ounces empty due to it 's 500D Cordura construction.